I’m still buzzing from the Ride show at the Warfield. “Cool Your Boots” has been running through my head non-stop for a week (although there was a break, at least in my sleep, when I had a dream which involved listening to Cedric Im Brooks). Since the show I’ve been listening to a lot of shoegaze (and a little chimp rock — anyone remember that?). I’ve also met a couple of people since getting back from San Francisco with whom the subject of music arose. Two of them were on their way from Coachella to Brokechella and were talking about “soul” (in the sense that Maroon 5 are soul, I suppose) act, Fitz & the Tantrums. No one had heard of Ride or had the haziest notion of what shoegaze means. When I told them that Ride had played at Coachella they looked incredulous. Whether one is a fan of shoegaze or not, I reckon that it was that last moment in rock’s history when something happened that was both significantly different from what had come before but still recognizable rock music. Shoegazers pushed the boundaries of rock with ethereal ambiance and post-psychedelic noise; beyond those boundaries lay Metal Machine Music or Ambient 1: Music for Airports — which whatever you think them have little to do musically with the rock ‘n’ roll of Jackie Brenston, Little Richard, Chuck Berry, and the like. After the roar of shoegaze subsided, rock music retreated into safe territory and we got regular-guy roofie rock bands like Better Than Ezra, Dishwalla, The Verve Pipe, Sugar Ray, and Oasis. In the 20 years since there have been great rock bands like The Libertines, but they like the rest offered revivalism and pastiche. After shoegaze rock became a genre like ragtime, soul, and hip-hop; comprised of a canon of oldies and to be DJed at bar mitzvahs and performed live for audiences more interested Jamie Chung’s fab festival wear than the music being played… especially when so much corporate pretendie sounds scarily like Ooh Yeah!-era Hall & Oates shilling shoes for Geico. I liked “Black Metallic” and “I Want to Touch You” so much that I nearly picked up a copy of Ferment fromBMG. When they released Chrome they claimed they’d been unhappy with Ferment… which struck me as troublesome because it was to me the superior record. Chrome had some good songs. The same couldn’t be said for Happy Days, which saw a bro-ham vibe began to take over. Did everyone in the band always have asoul patch? Where’d that puka shell necklace come from? Why are you covering Roger Waters-era Pink Floyd? The Boo Radleys‘ Ichabod and I was not especially memorable or original. Everything’s Alright Forever swapped J. Mascis affectations for Kevin Shields ones, which suggest a lateral move but came with a better record. Giant Steps was exactly what the title suggests… and also a fairly step away from shoegaze. Then they made that song “Wake up Boo!” which put me off so completely that I have never listened to anything from that point on. Swervedriver sang songs like “Son of Mustang Ford.” Their singer, Adam Franklin, had dreadlocks. They toured with Soundgarden when Soundgarden were still somewhat interesting. These are things to remember whenever someone characterizes shoegaze as a wimpy, listless, miasma or whines about the “unbearable whiteness of indie.” After Raise (1991) and Mezcal Head (1993) I lost touch with them but they released Ejector Seat Reservation (1995), 99th Dream (1998), and after reforming, I Wasn’t Born to Lose You came out earlier this year. Probably encouraged by the rivalry-stoking British music press, Revolver made the ballsy claim to be better than Ride. They weren’t, which probably made people take them less seriously than they would’ve if they merely claimed to be better than, say, porridge merchants like Slowdive. Revolver released the 45 andCrimson EPs in 1991 but didn’t get around to releasing a debut LP until 1993’s Cold Water Flat, which is not a bad record just probably not shoegaze enough to please their by-then dwindling fanbase nor in line with where British rock was going at the time (which was backwards). They recorded demos for a follow-up but split in 1994. When understandably people wonder why American shoegazers often display goth tendencies I point to4AD shoegazers like the Pale Saints. They were on 4AD and although they started out poppy, the quickly developed a rather “black candles and dead roses” vibe with songs like “Hair Shoes” which endeared them to the more ethereal end of gothdom. Of course, they also gave us “Throwing Back the Apple,” which was one of the best shoegaze singles. Lush too were on 4AD and sometimes a bit goth with a lowercase ‘g.’ Their original singer quit the band to sing with Pale Saints, in fact. Without her, Lush released the impressive six-track Scar in 1989. The Mad Love EP followed, as did five singles, before they got around to releasing and LP — which as silly as it sounds (and was), was something on which a lot of importance used to be placed. Spooky finally arrived in 1992 and received some criticism for Robin Guthrie‘s (Cocteau Twins) muddy production although I think it works great. It was followed by Split, which didn’t do as well, and then their final album, which wasn’t at all shoegaze but instead offered slightly retro guitar pop (Britpop demanded as much that produced the minor classic “Ciao!,” a duet between Miki Berenyi and Jarvis Cocker. When they began in 1987, Chapterhouse were lumped in (and performed with) latter day space rockerslike Loop, Spacemen 3, and The Telescopes. By 1990, when they released their first EP, Freefall, they were clearly deeply influenced by the then prevailing Baggy scene. The Sunburst EP suggested that they’d discovered dream-pop pioneers A.R. Kane. Songs from both EPs were included on their debut,Whirlpool, which was followed by the more cohesive Blood Music. Led off by the track “Mesmerise,” it was a step forward for the band but in a year dominated by Ace of Base, Nirvana, Suede, and the Wu-Tang Clan, out of step with the times. My Bloody Valentine were the creators. The Irish band began in 1983 owing more to The Birthday Partyand The Cramps but by 1987 they were making slightly shambolic twee-pop like that year’s “Sunny Sundae Smile.” After original singer Dave Conway bowed out, “Strawberry Wine” suggested that changes were afoot but “You Made Me Realise” was revelatory. Isn’t Anything topped that and according to the jvox populi, 1991’s Loveless was the pinnacle of shoegaze. 22 years later they released its follow-up, mbv which I know some people bought and were charitable toward but I don’t exactly hear them going on about it in the same way. 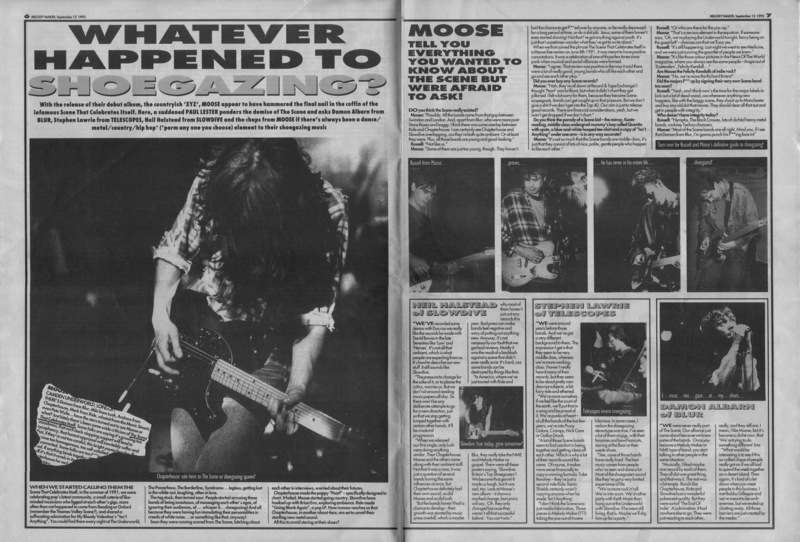 My Bloody Valentine may’ve been the band who created what came to be known as shoegaze but Moosewere the first to be slapped with that tag. In 1991 they released “Jack,” the Cool Breeze EP and theReprise EP. Their debut full-length, XYZ, was like the music that had come before, dense, atmospheric, and adventurous — if only remotely shoegaze. Honey Bee, Live A Little, Love A Lot, and after a five year wait,High Ball Me! followed — all of which are pretty sterling stuff but bafflingly ignored by record buyers and music streaming services. In the 21st Century that’s like not existing. Ride were not the originators, nor the first shoegazers — but they were they best. What they did with melodies, harmonies, and feedback is so wonderful and complete on its own that they opened my eyes to the fact that a band could have crap lyrics but still be utterly amazing. Their debut, Nowhere, came out in 1990 and was better than any shoegaze statement before it. Its follow-up, Going Blank Again, was even better by some measure. Carnival of Light was unfairly savaged as even though it was a major shift in sound, is still a masterpiece. Tarantula, on the other hand, was quite rightly savaged and deleted after a week. EvenTarantula has its fans, actually (their names are Fred and Matt). After that they broke up but following the example of My Bloody Valentine (in 2007), Swervedriver (in 2007), Chapterhouse (in 2008), and Slowdive (in 2014), they decided to give it another go and so far so good. Now if only Moose would come back!